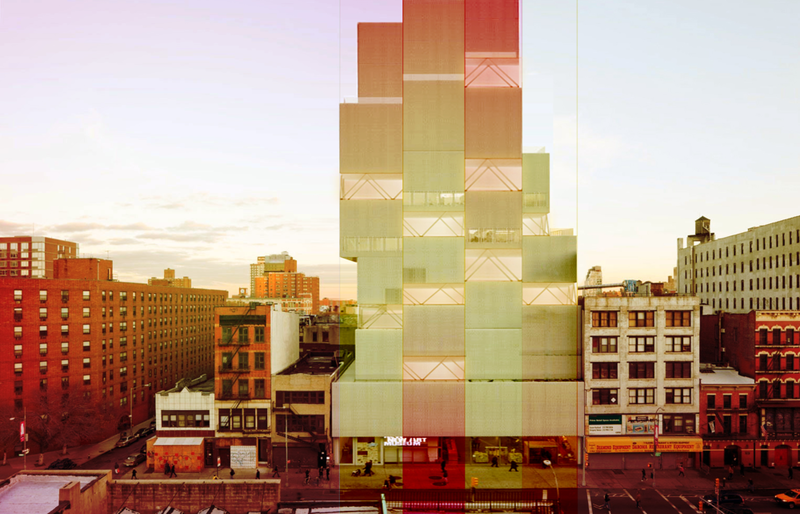 The New Museum by SANAA is conceptually composed by a pile of boxes that shift and offset as the level goes higher. We are proposing an newer version of New Museum in the similar logic by raising the gaps between each level according to the scope of the additional exhibition curated. The dynamic truss system pins on one end and slides on the other end, so a level can be any position between entirely hidden or full story tall. The weight of the building is accumulated from top to bottom, so the lower portion requires more structural support than the upper portion. This can be achieved by a few stronger structural members, or many weaker members. The number of members needed is determined by the structure type, strength and loads. And the resulting number count, unit price and clear height will ultimately determine the cost of each structural level. The clear height factor is placed to keep the height of the building in control. Intuitively, the four different type of structural members from our selection list will results in a diverse range of structure spatially and economically. The first goal of the galapagos process is to find the most economical selection of the structural system under a given budget, while keeping the selection of each level independent. The large open area created is desired, whereas shadowing from boxes above should be as less as possible. So the invert shadow calculation puts an economic factor that prevent the gap level from being too low after the structural evaluation. A similar method of solar radiation analysis is conducted using DIVA for grasshopper. It can achieve higher precision, and it provides a more visual solar radiation map. But the impact for other factor evaluation from DIVA is not very obvious. The final result of the galapagos selection enable us to quickly pick the most desired combination of structural elements within the limited budget and structural requirement from a large variety of solutions. The ability to estimate and control the cost and benefit of such design could be very valuable in the next phase of design as it moves from schematic to design development.